Author Bill Knoedelseder chronicles the influence of Harley Earl, Detroit's Steve Jobs, on the auto industry. General Motors is setting out on a course to reinvent its business in the age of Uber, Tesla and self-driving vehicles — in the process slashing more than 14,000 salaried, executive and blue-collar jobs and closing plants to cut costs. As GM is hoping to reignite its innovation engines, it is worthwhile to look back at the company’s legacy that has spanned a century. Back in the 1920s, the automaker introduced the concept of mass-produced stylish cars after recruiting a Michigander named Harley Earl from Hollywood. A new book by veteran journalist Bill Knoedelseder chronicles how Earl changed the auto industry through his vision and artistic creativity. 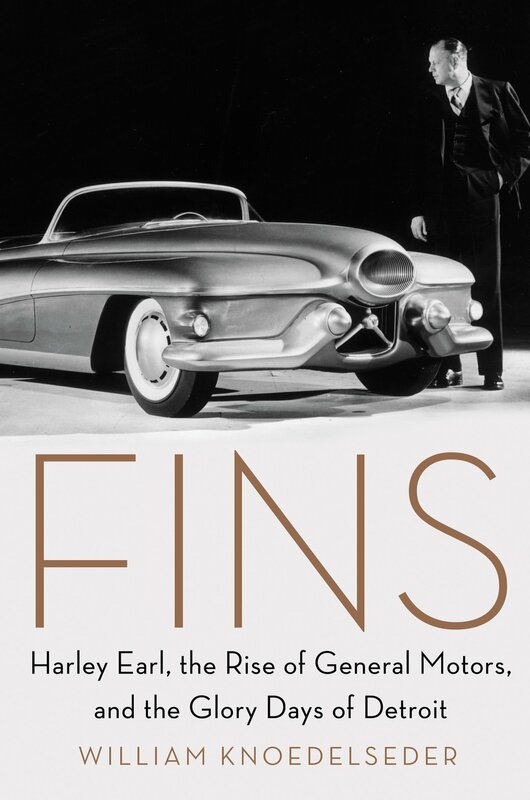 In Fins: Harley Earl, the Rise of General Motors, and the Glory Days of Detroit, Knoedelseder describes Earl as the Steve Jobs of his generation. The author joined the Knowledge@Wharton radio show, which airs on Sirius XM, to discuss one of America’s greatest innovators. (Listen to the full podcast above). Knowledge@Wharton: What inspired you to write this book? Bill Knoedelseder: I originally set out to write a book about the car business in the 1950s because when I grew up in the 1950s, my dad was in the car business, and I remembered it as a magical time. I remember the moment the seeds were sown in 1955 on a hot summer evening, when he pulled into our driveway with a pink and white DeSoto Firedome hardtop, and all the kids came running down the street from the ice cream truck to climb all over the car. From that moment on, cars were it for me. When I started researching the book, I stumbled right away onto Harley Earl, who I’d never heard of because I didn’t know very much about cars. I started looking into his history, and all of a sudden, I was writing a history of how the car business started. It was fascinating. Knowledge@Wharton: Can you tell the story of how Harley Earl’s family ended up in Hollywood, Calif.? Knoedelseder: The family literally crossed the plains in a covered wagon. His father came from Michigan, settled in Southern California, and he opened up a carriage shop. They moved from downtown Los Angeles into a little dirt street village up in the hills called Hollywood at almost the exact minute that D.W. Griffith arrived with a camera crew and started shooting silent movies. The first thing you needed to make movies was vehicles. All of a sudden, his dad was making Roman chariots and chuck wagons and stagecoaches for the movie business. That’s how Harley, as a teenager, got to see and hang around Cecil B. DeMille and these other people. He ended up taking what he learned as a carriage-maker in his dad’s shop to making fancy car bodies for silent film stars like Tom Mix and Fatty Arbuckle. They had all the money in the world, and they weren’t satisfied with the clunky-looking vehicles that were being churned out of Detroit. Model Ts were not it for them. They wanted something flashy, and that’s what he did for them. He was the first car-customizer. These were flamboyant people by nature. He played that. He was the flamboyant show business kind of person, and that’s what Cecil B. DeMille saw in him. That’s why he took him under his wing and mentored him a little bit. Harley got to participate in the birth of the movie business and the car business. Those two industries developed together; they became very uniquely American. Knowledge@Wharton: He was recruited back to Detroit. How much did his love of design help Detroit develop its own love of design? Knoedelseder: It made all the difference in the world, and it made all the difference to how America developed. It’s sort of unsung. Henry Ford produced a very utilitarian car. He kept selling it for 15 years. It was the same car. He wouldn’t change it. Everybody who could afford a car had a car, then they’d replace it every seven or eight years. General Motors was this company that was trying to complete with Ford, and they realized they couldn’t possibly try to out-produce him, unless they could figure out a way to make their cars look better and change their looks more often because he didn’t ever change his. That was the chink in the armor. They heard about Harley. They brought him to Detroit and hired him to figure out a way to do this on a grand scale, which is very expensive to do. They didn’t want to shut down their factories and have to retool every other year. That costs hundreds of millions of dollars. He figured out how to make a system that made it affordable. There was a constant, gradual change, so that every year General Motors cars looked a little different from the year before — but not so different that it would hurt the resale. That’s how General Motors not only vanquished Ford but became the most successful corporation on the planet. Knowledge@Wharton: You start the book with the dedication of the GM Technical Center in 1956. What was important about that event? Knoedelseder: It was very symbolic because it was a testament to the possibilities of the company and America. It was after the war. It was the apex of the country at that point. We were the most powerful political or economic force on Earth, and they were trying to make something that lasted, that spoke to what they’d accomplished and what the future might hold for all of us. They attracted everyone. The cream of the crop of the brain trust of America came to this dedication. There’d never been anything like it before in terms of how it looked. It was very, very modern. It was classic, and it was quite a big deal. When I read about that, I realized that I had to start at that moment. Things after that went a different way. It didn’t work out exactly the way they thought at the time. They couldn’t foresee at that moment that there would ever be a time when General Motors and Detroit would declare bankruptcy. Knowledge@Wharton: How much influence do you think Harley Earl still has in Detroit today? Knoedelseder: I don’t know. I think he’s honored. I think they’ve sort of forgotten about him, but I think the people who know cars and know the history of the business know what he accomplished. But I don’t see it out there. Cars are just monotone. There’s gray and white and black. They all look kind of the same. They’re all sort of the same shape. They clearly took the fins thing too far in the ’50s. But when I was writing this, I came to see the fins as a metaphor for a period of time — a time of exuberance and hope and flashiness and arrogance. But I don’t see that anymore. I’ve driven the Tesla, and it’s an amazing car. But next to a ’55 Chevy, it’s like a giant iPad. Knowledge@Wharton: You described Harley Earl as combination of Steve Jobs and Tom Ford. Take us into that combination, please. Knoedelseder: His idea was that form was as important as function. He would write things, and GM would put things in their literature, that sounded like Steve Jobs had written them three years ago. It was important that it worked, but how does it look? How can we make it look better as it’s driving from here to there? What does the public want? It’s got to look cool, too. That’s what he was all about. Well, that hadn’t occurred to everyone. Industrial design was just starting back then, and there wasn’t even a recognized profession for automobile styling. It has been done by stodgy old engineers. Their idea of designing a car was bolting fenders and a little passenger capsule to a chassis. He changed it from an engineering culture to a styling culture. Knowledge@Wharton: Can you give more details about how GM recruited him to Detroit? Knoedelseder: Three-fourths of the cars on the road at the time were Fords. GM was a distant second, and they had to figure out something. The chairman had the idea of, “We need to make them look different more often.” One of the Fisher brothers, who was an executive for the company, had gone out to Hollywood and met their big Cadillac dealer on the West Coast, who introduced him to Harley, who was doing custom work for rich movie people out there. Larry Fisher was impressed. They interviewed him and hired him, and he left California with his family and went back to Detroit and never returned to California to live. He spent the rest of his career in Detroit. He started from scratch, actually started hiring sculptors from art schools and stuff like that and putting them to work in this big manufacturing entity. It was bizarre, if you really think about it. The other thing he did was he was the first person to use modeling clay to make full-sized models of cars before they decided to produce them and invest the money. Before, they would just be a line drawing on a big piece of paper. He would make these cars out of clay, and they would look so real that you could walk up to them and expect to open the door, climb inside and drive off. That changed everything. Everybody started doing that. That’s the way they still do it today. His influence on the industry is incalculable in the innovations that came up, because he put the cart before the horse. Under Harley, you would start with how you wanted it to look. Before that, the engineers would say why something couldn’t be done. Then he would show them, “Well yeah, but here’s what we want it to look like. How do you change the chassis? How do you lower this to make it look like that?” He forced that. The engineering culture at General Motors was not in favor of Harley in the beginning. The engineers were in charge, and they didn’t need some fancy-dressed guy from Hollywood telling them what to do. They’d call him a “pansy” and a “sissy” because he was very flamboyantly dressed compared to them. He had these elegant clothes and colors and pink socks because he was a designer. They wore dark suits and suspenders and Homburg hats. There was a big culture clash there that he won. Knowledge@Wharton: You tell an interesting story in the book about the LeSabre. It’s an iconic car that debuted at Watkins Glen in New York, one of the iconic racetracks of America. Knoedelseder: That was one of the first public appearances, yes. They took it up there to show it off. It was his personal car, a one-off. There might have been a couple over a period of years, but it was never put into production as a production car. It was wholly experimental and looked like nothing anyone had ever seen. He went up there to Watkins Glen to show it off, and that was the weekend that he got the idea for the Corvette. He was up there showing off this exotic convertible that had computers on board and a tank for high-octane, alcohol-based fuel, and he saw all these college students driving MGs and little foreign, mostly English sports cars up there. He realizes that these were the coming buyers, and there wasn’t an American car made for them — an inexpensive sports car like an MG. He went back to Detroit and said, “Let’s make the first real American sports car.” The LeSabre was a two-seater convertible, but it weighed 5,000 pounds. It wasn’t a sports car by any stretch of the imagination. They took it to Gen. Eisenhower’s command headquarters in France after the War and let him get in it. One of the innovations was that a drop of rain would raise the convertible top. This was way before anything like that ever happened, and they would test it with a little eyedropper they had. Eisenhower, who had just moved armies all over the continent, got a big kick out of being able to sit there and do a little eyedropper mark and watch this thing go up. There are pictures of him laughing while he did this. Knowledge@Wharton: I wanted to ask you about the Corvette. The early days of the Corvette, and then what it became in the 1970s and 1980s and 1990s, were kind of different vehicles because of the body style. Knoedelseder: The Corvette almost failed because it hardly sold at all. The idea of this pared-down sports car was one thing, but the price that they came up with, and by the time they got it ready for production — those college students who were driving the MGs couldn’t afford the $3,500 to buy a Corvette. Then they were trying to sell the Corvette to well-to-do middle-aged people, who didn’t want a car that was pared-down like that. So, it struggled in the first couple of years and was beaten in sales badly by the Thunderbird, which was designed by one of Harley’s trained designers, Frank Hershey. Ironically, Hershey was the guy who designed the first fin they put in the ’48 Cadillac, and after that he got fired by GM. He went to Ford, and he designed the 1955 T-bird. These are great stories. Knowledge@Wharton: What do you hope would be the lasting memory for readers of this story of Harley Earl? Knoedelseder: Just how the country developed, what it was like in the 1950s. We always hear about, “Yeah, that was when America was great.” That’s what everybody waxes poetic about. It really was in a lot of ways great. It wasn’t quite so rosy as we remembered it, but this is how we got there. It’s how the car became our defining product for the world. We really became dependent upon it. If sales of GM went down, we had a recession. I wanted this not to be a book just for car geeks and the people who read car magazines. I want women to read this and say, “This is a rollicking good story about an amazing time in America.” It had to do with car-making, but that’s not really the story. The story is about America and the progress that we made and how it all happened — and how this crazy, 6-foot 6-inch, stuttering, dyslexic designer affected it all. That’s the story.